Still space left… register soon! 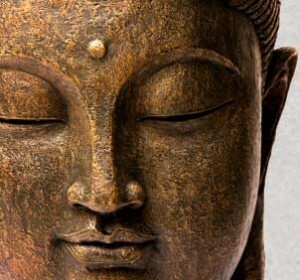 This very special retreat offers a unique opportunity for Dhamma students to engage in two weeks of practice grounded in the Vipassana teachings and practices with an orientation towards investigating Self–Not Self in relation to the creative process. 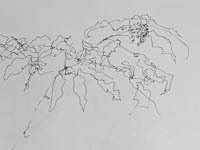 Along with sitting, walking, Dhamma talks, individual practice interviews and some group discussion, we will explore the flow of creative energy in relationship to “self-view” via movement, seeing/drawing, and writing. 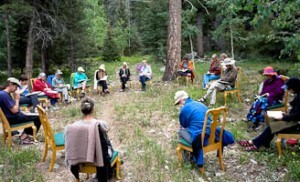 One need not have any experience with any of these creative modalities to participate in this retreat. 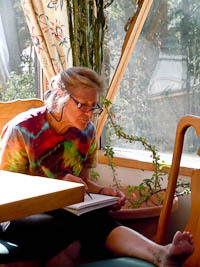 Marcia Rose is the Guiding Teacher for The Mountain Hermitage’s two-week Self-Not Self and the Creative Process Retreat. 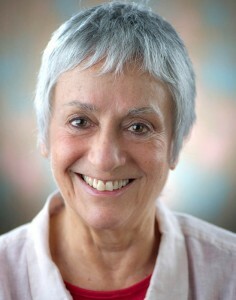 She will be assisted by movement teacher Wynn Fricke and writing teacher Sean Murphy. 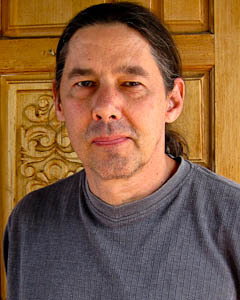 The retreat will provide an opportunity to train with the guiding teacher and the assisting teachers in various creative modalities along with the development of a sustained mindfulness and concentration practice. This will contribute to a comprehensive deepening of practice and understanding. 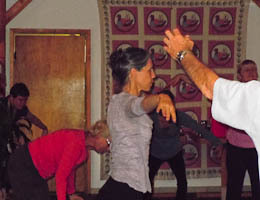 MOVEMENT: Through guided movement improvisations, we heighten sensitivity to the felt experience of the body. We learn to follow visceral responses and attend to the multitude of impulses and intentions that underlie our physical actions. Through quiet attention, we begin to explore perceived boundaries of internal and external, as well as the ways in which Self and No-Self show up. These movement meditations provide a joyous and healing opportunity to release into the body’s profound sensitivity and creative response to present moment experience. SEEING/DRAWING: Seeing/Drawing is a way to achieve intimate touch with the visible world around us, and through it, with ourselves. Our practice will be to receive what is seen without interposing the ’self’, to allow the mind, the eye and the heart to simply reflect like a clear mirror. From this springs the ability to contact things directly and positively, letting the hand (and pencil) follow what the eye sees without the thought of ‘making’ a picture or ‘being’ creative. 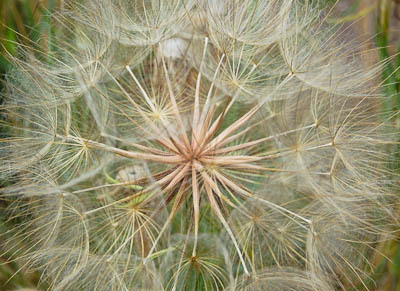 Our Seeing/Drawing will be the practice of contemplative awareness in relationship to a world that is fully alive. As we begin to draw, suddenly we begin to see. And as we begin to truly see, suddenly we are drawing in a way we may never have experienced before. WRITING: No-self is actually where all creation comes from. Words and thoughts arise as though from nowhere — and we can learn to trust the process, and let it inform our creative work. What happens when we let go of ourselves and let the writing arise from this empty space? That’s no-self. That’s our starting place… In practice this means we’ll work with guided meditations, sensory/ mindfulness exercises, and free-writing to touch that deep place in our creative process from which true inspiration springs. 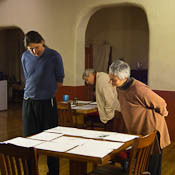 Marcia Rose will lead the seeing/drawing portions of the program, Wynn Fricke will lead the movement portion, and Sean Murphy will teach the writing segment. 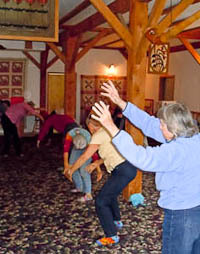 Yogis are expected to maintain sustained and continuous practice during their time at The Mountain Hermitage. Teaching support will consist of six to eight evening Dhamma talks and four to six individual practice interviews during the two weeks. Before each Dhamma talk there will be a renewed yogi group commitment to the refuges and precepts. Yogis will undertake one hour of work meditation daily. For this retreat, we are easing our usual practice requirements to invite anyone with a sincere interest in the Buddha Dhamma. You will still need to complete an application for this retreat, and it will be reviewed by the guiding teacher. Please be sure to fill out the application sections on your meditation and retreat experience, as this information will be helpful to the teachers. Where applicable, include details of the retreats, including teachers’ names, dates, location and length of the retreat. The Mountain Hermitage offers a uniquely supportive space of solitude and silence for individuals who wish to participate in this unique retreat. Our foundation practice will be Vipassana, which may at times be supplemented by concentration or other awareness practices. In order to benefit from this environment, applicants need to be at least somewhat self-sustaining in their practice and be comfortable in unbroken silence and solitude. All participants must be mentally stable and physically able to care for themselves. Everyone must have health insurance or be able to cover their expenses in case of illness or medical emergencies. Any special needs must be discussed and agreed to in advance, as the staff is very small and cannot accommodate high levels of support for any individual. The retreat will be limited to 16 practitioners, so early application is suggested. It is asked that retreatants commit themselves fully to their stay. All business and family obligations should be taken care of prior to arrival so that practice can be uninterrupted. 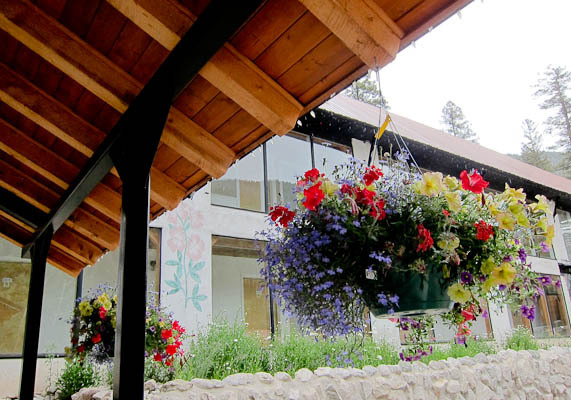 Besides the guiding teacher and the assisting teachers, the staff of this two-week Hermitage retreat will consist of a resident retreat manager (the point of contact in case of any difficulties) and a retreat cook. There will be three nutritious vegetarian meals per day. Columbine Inn is situated at 9,000 feet among tall pines in a mountain setting at the beautiful Taos Ski Valley and provides the privacy, quiet, and sense of harmony that is most conducive to intensive practice. There is a spacious room for the movement, drawing, and writing practices, a separate meditation hall, and indoor and outdoor walking areas. 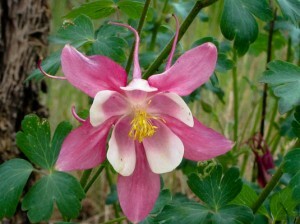 The Mountain Hermitage will have exclusive use of the Columbine Inn during the two-week period of the Self – Not Self retreat. Retreatants paying at full cost or above will have their own single room and bathroom, while those receiving scholarships or paying at the low end of the scale may possibly be assigned to share a spacious double room with attached bath. 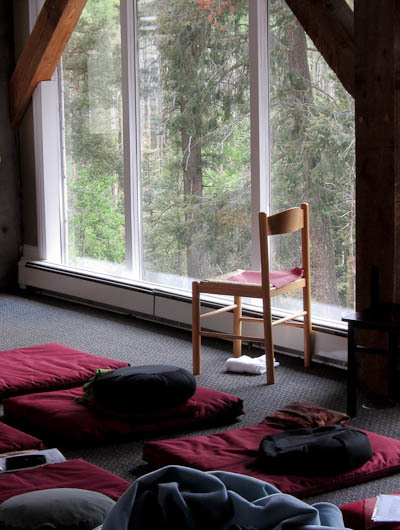 Each room, whether used as a single or double, is spacious enough to allow for both sitting and walking meditation for those who wish to practice in a more secluded setting. 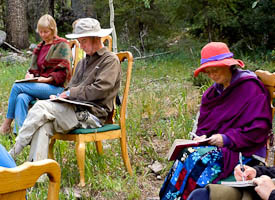 The retreat schedule will consist of group events such as meals and Dhamma talks, along with periods of movement practice, seeing/drawing practice, and writing practice. The schedule will also include periods of sitting and walking. We will begin with two days of intensive sitting and walking practice. Between each three-day period of the creative modalities, there will be a full day of sitting and walking practice. Fees are on a sliding scale to allow you to pay according to your means. Our actual cost for the two weeks per retreatant is $1,460. A portion of our scholarship funds is being allocated for this retreat to allow us to continue to offer the mid and low ranges on the sliding scale. Please pay as much as you are able to allow others to attend who need to pay less. Any amount above $1,460 will be gratefully received and treated as a tax-deductible donation. Additional scholarship funds are available. Please fill out the special scholarship application form and include this with your regular application form. The Mountain Hermitage will gratefully receive donations to our scholarship fund to enable those in financial need to attend this retreat. Donations are tax-deductible and should be marked ‘Scholarship Fund’. 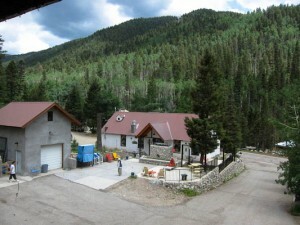 The retreat fees only cover basic expenses and operating costs. 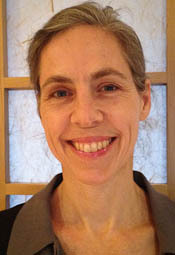 The teacher(s) offer the Buddha Dhamma without any set fee, and totally depend on DANA – on the generosity of their students and benefactors – for the support of their daily life needs. 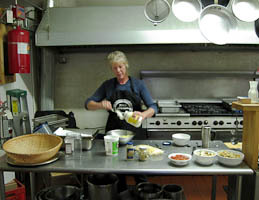 Your fees for the Self – Not Self & the Creative Process Retreat will be used to pay for: rental of the Columbine Inn and attached expenses; other general retreat expenses; a retreat cook; a small stipend for the retreat manager; a small parsonage to the teachers to help cover ongoing home expenses for the duration of the retreat; teacher transportation. The full deposit must accompany your application, even if you are requesting scholarship funds. No monies will be banked until you are accepted on the retreat. The balance of the retreat fee is due when you arrive for the retreat, or you can mail the balance to us in advance. If possible, we appreciate you paying the full fee (deposit plus balance) at the time of application or on acceptance, as this improves our efficiency. However this is not necessary. Please pay by check or money order in US funds, drawn on a US bank. We cannot accept foreign cash or bank drafts, but we can accept international money orders in US dollars. Cancellations received on or before April 31, 2014: your deposit will be returned minus a $75 cancellation fee. Cancellations received between April 31 and May 22, 2014: your deposit will be returned minus a $150 cancellation fee. Cancellations received between May 22 and June 22, 2014: your deposit will be returned minus a $250 cancellation fee. paid the balance, then that balance will be refunded minus the $350 cancellation fee/deposit. CANCELLATION FEES WILL BE APPLIED TO THE MOUNTAIN HERMITAGE SCHOLARSHIP FUND (after the cost of the retreat is covered). In the event of specific, unusual emergency circumstances, the cancellation policy can be discussed with The Mountain Hermitage Administrative Assistant after the retreat is concluded. Anyone interested in attending the retreat must read this document and the separate Practice Guidelines document. Then, complete the Application form and Waiver of Liability, attach your deposit, and mail to: The Mountain Hermitage, PO Box 807, Ranchos de Taos, NM 87557. Applications and deposits are requested by April 31, 2014. Late applications will be considered on a space available basis. Applications will be accepted only by mail, not by phone, fax, or e-mail, because they must be accompanied by the appropriate deposit. Incomplete registrations, including those without sufficient deposit, will be returned for completion. Each application will be carefully reviewed. In some cases, a personal or phone interview will be conducted with the guiding teacher prior to determination of suitability for this type of practice. All applications are processed by date received. We will respond within four weeks from receipt of your application.